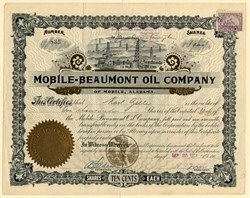 Beautiful certificate from the Mobile-Beaumont Oil Company. This historic document was printed by the Goes Company and has an ornate border around it with a vignette of an Oil towers. This item has the signatures of the Company’s President, Harry T. Inge and Secretary, A. L . Selden and is over 109 years old. President, H. T. Inge: vice-presidents, P. J. Lyons and P. D. Barker; secretary and treasurer, A. L . Selden. The company will bore for oil in several localities in the vicinity of Mobile.